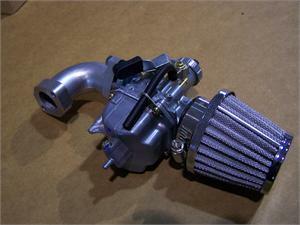 Has a Turnout intake, turns the Carb out to the left approximately 30 deg to the left side of bike. Comes with cone style air filter, filter is chrome with stainless wire mesh with a cotton filter element. Not recommended for an engine under 110cc. 3/16" 25 FOOT ROLL BLUE POLYURETHANE FUEL LINE. High tensile strength; withstands temps from -65°F to 220°F w/o deterioration., kink-& abrasion-resistant, transparent blue polyurethane line w/ exceptional chemical resistance including gas/grease/oil.